Over the years we have kept a few dogs in partnership, the details of the dogs and their co-owners can be found on this page. Sonstraal Dream the Dream at Saadani JW is owned in Partnership by Lisa Aitken of the Saadani kennel and Russell Mosedale, who also co-owns McGraw and Peaches. 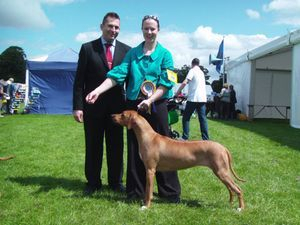 She continues to do well at both Open and Championship shows across the country winning RCC at Belfast 2013. Sookie is pictured with Russell and Lisa, July 2012. Rex Ventors Uptown Girl at Saadani (Imp) aka Minx is owned in Partnership by Lisa Aitken of the Saadani kennels. 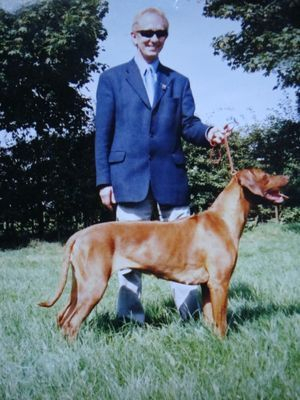 She was bred by Veronica Thoren in Sweden. Ch Sonstraal She's a Devil Woman JW ShCM, affectionately known as Harriet is owned by Sharon Rossiter and Mary Pratt (pictured). She lives with Mary, George and her Sonstraal sibling, Pippa (Teddy's sister). Chilolo Shha Shoot for the Moon (Imp) aka Brad was imported from Australia and is owned in partnership with Gillian Hutcheson (Gabisa). He lives with Sharon and the Sonstraal pack. 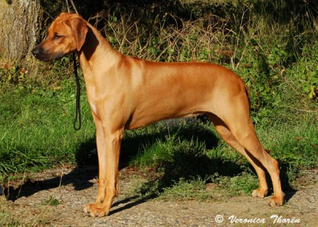 Weimpoint Loch Ness (Imp) aka Nessy was imported from Belgium and is owned in partnership with her breeder Kristina Pilatus-Lenaerts and Lisa Aitken (Saadani). Nessy lives with Sharon and the rest of the pack where she rules the roost! 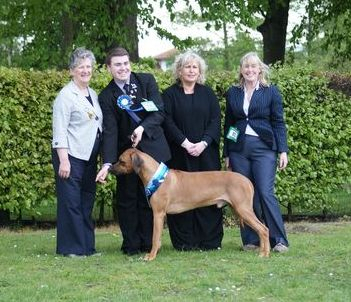 Highlights were winning Best Puppy in Breed at her debut show and winning the Puppy Stakes. 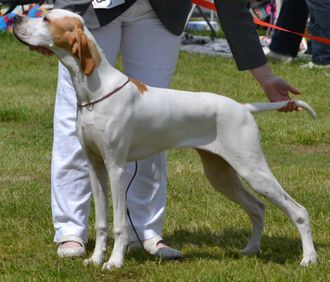 McGraw aka Am CH Marsuz Alydar I Like it I Love it at Solivia is owned in partnership by Sharon Rossiter, Anthea Fox and Russell Mosedale, and has flown in from the USA to join the pack. Sonstraal Chocolate Drop aka Peaches is owned in partnership by Anthea Fox, Russell Mosedale and Nicholas Boyd and lives with Sharon and her Sonstraal family. Peaches is the sweetest girl, who gained her Stud book number from limited outings and can be seen occasionally in the ring. CH Sonstraal Gabe's Prospect at Sescheke JW ShCM. 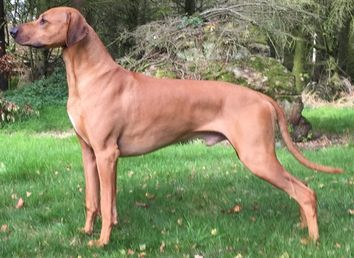 Teddy is owned by Sharon Rossiter, Anthea Fox and Nicholas Boyd and resides with Nicholas and his mother in Edinburgh with some of his offspring at the Sescheke kennel. Teddy is a handsome, laid back chap who has a wonderful ground covering stride. He continues to do well in show rings up and down the country. CH Rex Ventors Gabriza (Imp Swe) is owned in partnership with Sharon Rossiter, Anthea Fox and Tom Johnston (pictured). Gabby is now retired from the show ring but her progeny Teddy, Kainda, Lexy and Anny continue to fly the flag.